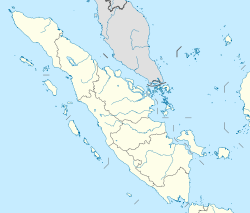 Padang Pariaman Regency is a regency (kabupaten) of West Sumatra, Indonesia. The regency capital is Parit Malintang. It has an area of 1,328.79 km2, and the population was 390,204 at the 2010 Census; by January 2014 the official estimate was 411,378. West Sumatra's capital and biggest city, Padang, is surrounded by this regency. Astronomical position Padang Pariaman which lies between 0 ° 11 '- 0 ° 49' south latitude and 98 ° 36 '- 100 ° 28' east longitude, with a total area of about 1328.79 km ² and a coastline length of 60.50 km ². Region's land area is equivalent to 3.15 percent of total land area of West Sumatra Province. Temperatures ranged between 24.4 °C - 25.7 °C, so for the average maximum temperature of 31.08 °C and average minimum temperature of 21.34 °C, with 86.75% relative humidity. Average rainfall for the district overall Pariaman in 2007 amounted to 368.4 mm, with an average days of rain as much as 19 days per month and the average wind speed is 2:14 knots / hour. West Sumatra Province is a mountainous district nearly 3,000 meters in elevation made of Paleozoic sedimentary rock and Igneous rock that extends from the active row of volcanoes to the east. The Great Sumatran Fault divides the center of the province—the fault topography clearly visible—in a North-northwest to South-southeast direction. The stretch of land between the central mountain range and the shore is made of volcanic uplands and pyroclastic flow uplands with a narrow coastal plain distributed along the seacoast. Towering above the eastern side (i.e. the mountain side) of Padang Pariaman are two large volcanoes; Gunung Tandikat stands at 2,347m and Gunung Singalang at 2,877m, together forming twin volcanoes. Lake Manijau, located at the north end of Padang Pariaman, is a caldera lake measuring 20 kilometers north-south and 8 kilometers east-west which formed after a large volcanic burst 52,000 years ago. The volcanic products from this giant eruption are scattered over a wide area in the north-central area of Padang Pariaman. Today these volcanic products are seen as pyroclastic flow uplands and low relief hills. Recent earthquakes that occurred along the Great Sumatran Fault that cuts across Sumatra are the series of quakes of March 6, 2007 measuring Mw6.4 and the Mw6.3 earthquake in the vicinity of Singkarak lake, which occurred in eastern Kabupaten Padang Pariaman. ^ "Sumatran Plate Boundary Project :: Scientific Papers". Tectonics.caltech.edu. Retrieved 2011-01-08. This page was last edited on 27 March 2019, at 04:05 (UTC).